The Township provides leaf collection during the fall season through the first Friday of December, unless snow falls prior to the scheduled end date. Residents should place their leaves in the street along the curb line. Placing leaves in uniform sized rows along the curb as opposed to placing them in big piles, expedites the collection process because the units can continue to move forward as they are collect the leaves. Big piles of leaves are more time consuming to collect. 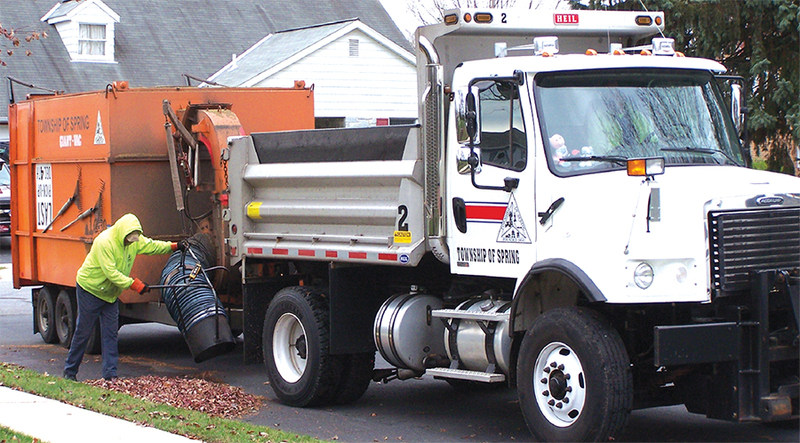 The crews will continue to rotate throughout the Township during the collection period. Specific collection dates cannot be set due to unforeseen weather conditions, equipment breakdowns and staffing levels. If heavy rains are predicted, we suggest you wait until after the storm passes to put your leaves in the street. Leaf piles could prevent the flow of storm water and clog storm drains. This service is intended for Spring Township residents ONLY. Please remove grass clippings from plastic bags before dumping. No plastic bags are to be left at the site. If you must bag your grass for transport, please use paper bags as the paper bags will compost. Only yard residuals will be accepted at the collection facilities. No other type of recyclable material, rubbish, trash, waste or garbage is accepted. Hours of collection shall be 6:00 a.m. through 9:00 p.m., May 1 through September 30 and 6:00 a.m. through 7:00 p.m., October 1 through April 30. Penalties: Any person, firm or corporation who shall violate any provision of this Part shall, upon conviction, be subject to a Hundred Dollars ($100.00) or no more than Six Hundred Dollars ($600.00) plus costs of prosecution. Each day of a violation shall constitute a separate offense.